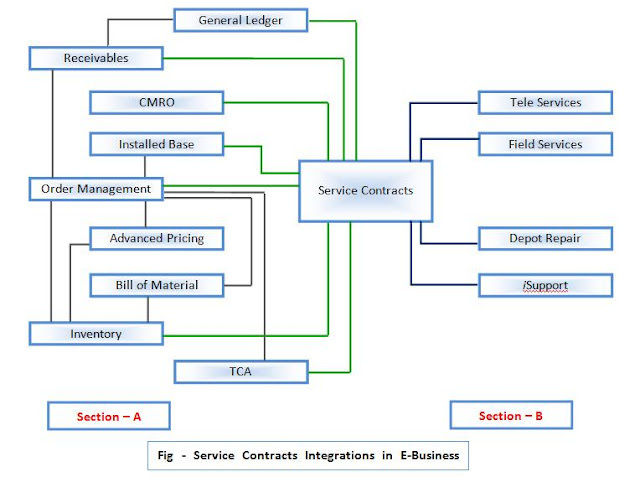 Oracle Service Contracts (also referred to as Service Agreements) are contracts that are usually sold to customers to support, repair and/or maintain some product or service that the customer owns. Oracle Service Contracts provides a complete contract authoring execution solution to manage warranties, extended warranties, usage, subscription services etc from its authoring, approval, billing or termination or renewal of entire contract or specific part of the contract. Sell different types of service to organization or end consumers. Define pricing and billing schedules for flexible billing and payment. Simplify change management for existing contracts. Section – B List outs module of Oracle Application which retrieves information from Service Contracts. In other terms we can say that these module get the input from Service Contracts. 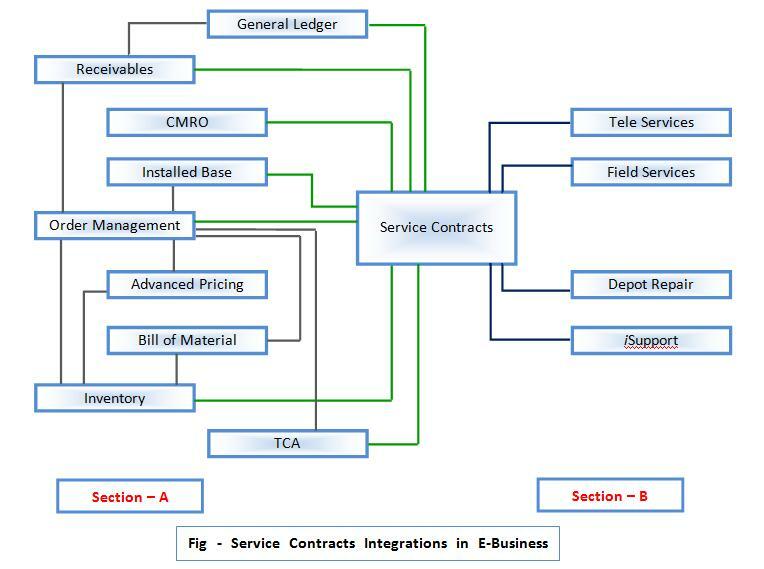 Please find the details of features used by Services Contract from different modules. Raises sales orders from which warranties and extended warranties are created. Inventory is used to define serviceable products and service items (warranties and extended warranties). Creates invoices and credit memos from the billing information generated by Oracle Service Contracts. Associates warranties with serviceable items. Supplies the information to price the services and usages sold on the contract. Provides details of trackable items and the tracking of counters. Provides details of preventive maintenance programs that may be associated with service contracts. Retrieves contract details for a customer such as account, end date, status, contract type& number on all of their contracts. Looks for the preferred engineers for a particular service. Has visibility to coverage levels & times, reaction & resolution times for coverage, billing rates and types for a specified coverage. Provides details for repairs, exchanges, replacements, and loaners, which may update the contract coverages. Has visibility to coverage details. Provides details about service and repairs to be carried out in the field.